This entry was posted on February 5, 2013 at 3:31 pm and is filed under CYCLING STRUGGLES. You can follow any responses to this entry through the RSS 2.0 feed. You can leave a response, or trackback from your own site. This seems like a good summary of the process of socialization that turns a person who rides a bike into a “cyclist”. When this has happened to you over many years, it’s easy to forget how alien you’ve become in the eyes of the rest of society. When I first got married, I used to tell my wife about the funny experiences I had on the bike (you know the sort of thing: “a taxi driver told me today that he didn’t care if he lost his license, he was going to kill me” or “some kids threw a half-full coke can out of the window of a car and hit me”) but I soon realised that she found these stories upsetting rather than funny, so now I reserve these stories for other cyclists. I am definitely a cyclist. But whenever resonding to public consultations, or in any debate, I take the position that we should have cycle-ways safe enough for an 8 year old to use. Yes, these things may slow me down, but ultimately I want my future kids to cycle in safety and comfort to school. A very interesting article that shows a good understanding of the problems we face as ‘ordinary people’ who want to be able to jump on a bike and go. Incidents like the ones described are why so many people ride on the paths in Peterborough despite cycleways and quiet roads. Oh dear, let’s take a tiny, unrepresentative sample and extrapolate to the thousands of people in the UK who cycle regularly. There are more than 60 million people in the UK. Thousands may well cycle regularly. Thoses thousands are a tiny, unrepresentative sample of the British population. I do think that one of the big problems with trying to mainstream cycling in the UK is that that the majority of people involved and committed to it are cyclists and as Dave nicely points out, that makes them different from the people they are trying to encourage to take up cycling. I’m not questioning their motives or efforts. – About 10 years back I was living in Bristol and involved in an initiative to set up some home zones. A couple of people from Sustrans (who do a great job and I’m not criticising them) came along to one meeting to explain how they could help and such. Great. Only problem was that one of them was wearing tight cycling shorts. They stood at the front of the room and were immediately different from everyone in the audience – and this was a receptive audience. – In 10+ years cycle commuting in the UK, I can only recall seeing a few well dressed people riding bikes. I vividly recall one bloke on a train with a Brompton, as he has a really smart suit and nice tie on AND a bike. I noticed his clothes as an exception. Practically everyone dresses as a cyclist and marks themselves out clearly as being of a different tribe. Great if you’re in the tribe but not so good if you’re looking for new members, especially if you’re wanting to expand to youth. I can see some criticisms coming about shallowness and the need to dress like this but…. – I’ve been living in Sweden for the last 10 or so years and I could probably count the number of people I have seen dressed like British cyclists. From their dress, style of bike and riding style, I’d hazard a guess that most of them are actually Anglo Saxon in origin. Its dark, cold, wet and such here and yet (nearly) no one deems it necessary to dress up differently from anyone else. So that people who use bikes are just that. They are not “cyclists” in the UK sense. So what? Well. I think that one key issue in all this should be that anyone involved in trying to change the culture around cycling should be doing it from the perspective of the cultural norm of the target group and not the norm of the recipient group. Great people like Jon Snow should drop the day-glow trouser clips, get a chain guard but continue to wear his normal clothes when being involved in cycle related public events. Perhaps slightly facetious but I hope you get what I mean. I used to be a “cyclist”, and to a certain extent I still am. But having children, and watching them get excited about riding their own bikes but having nowhere safe to do so, has made me realise what we lack in the UK currently. As a family we’re more “bicycle users” than “cyclists”, but there isn’t an English word for that. We’re “fietser” in Dutch, a word I’ve love to catch on in the UK! This also explains why it’s so difficult to get, and keep, a local “cycle campaign” going. The people who are “keen cyclists” are actually mostly happy with the current road environment, and so aren’t interested in campaigning for facilities to make it easy for non-cyclists to ride bikes. Some may even actually enjoy the thrill and challenge of the risks they take. Meanwhile the people who would like to use bicycles for transport, but don’t, just aren’t interested enough in cycling to get involved. All very interesting: thank you Dave for your valuable insight! I’m probably one of the ‘keen cyclists’ who don’t engage with campaigning for new facilities, but to be honest I don’t see any need for explanations involving group identities or seeking thrills. Simply, almost all the ‘facilities’ constructed round here (and in most places I’ve cycled in Britain) are badly designed, poorly maintained, uunswept, badly surfaced and thoroughly unfit for purpose, at least on a road bike and cycling at more than 9 or 10 mph. 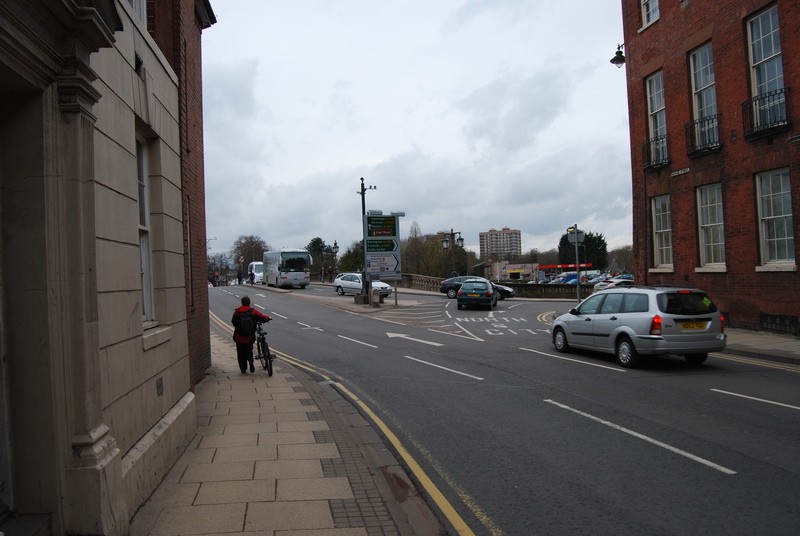 They are also frequently more dangerous than cycling on the road because of junction design (or lack thereof). They also aren’t designed with needs in mind of someone commuting by bike – they are almost ‘destination paths’ that people use at a weekend, frequently having driven to a convenient car park. Until I see some sensible attempt to design paths that actually make longer journeys off-road feasible and pleasant I’m not terribly interested. A feel that a key part of the UK cycling identity (that I share, at least in part) is well articulated by the 3 male profiles above and very visible on the streets (at least the streets of London where I spend much of my time when in the UK). I think you could summarise this as “the need for speed” or “me first.” Anyone who has cycled knows how similar these are to many (not all it must be said but a sizeable proportion) car drivers. So in many ways committed cyclists like these share exact cultural similarities with the car drivers that they often have to battle against – the me first, I’ve got to get there quickly, don’t get in my space, etc. norms. Basically being selfish and not considerate of others. If one has two groups with these similar attitudes but with easily visible differences and regular potential points of conflict then that is what you’ll get AND ingrained positions. In many ways I think these characteristics go much deeper than being a cyclist or not. I think they are an ingrained feature of British culture (to be safe, perhaps I should say English, as that is what I am basing my observations on). Maybe it’s another thing we can blame Thatcher for, but it does seem that the lack of regard for others on the road is a shared cultural trait of most road users and reflects a deeper malaise of British society? Is this an element of culture that might go some way to explaining the different experiences of cycling in say Sweden and Denmark when compared to the UK? Those two countries are renowned for tolerance and socially inclusive policies and attitudes. Is that one reason why riding a bike is more pleasant? I would propose that it is. Combined with the lack of differentiation (there simply is no them and us here, just people that use bikes and those that don’t) then this could well be an important element. Of course that doesn’t help get more people using bikes in the UK. I’m rather pessimistic on that front – I think it is possible but it will take so much time and effort and require such large shifts in cultural norms, that it is a multi-generational process. Not to say we should not work hard at it. Just wear nice clothes and ride slowly whilst doing so. Interesting stuff Dave. I try to steer clear of the “cyclist” term; my personal stance now is that “I’m not a cyclist, but I do often cycle”. Likewise when talking about infrastructure projects/programmes, I point out that we are trying to provide for “cycling” (the activity), not for “cyclists” (you know, that weird minority bunch of people who live in lycra, hug trees, don’t own cars, break road rules, and all those other interesting attributes that get ascribed to them). It is a deliberate strategy to point out that if cycling is to become an everyday normal activity, then “normal” people need to see it as something they can do. I use a vacuum sometimes to tidy my house – does that make a “vacuumist”? Thanks for this new piece of thought provoking writing. If you go out with any CTC group of a weekend, I think you will find plenty of assertive women cyclists as indeed you will also find on the streets of many UK cities from London, to Oxford, Cambridge and elsewhere. So I am afraid I find your representatives a surprisingly biassed selection and I feel a little affronted at your description of a supposedly ‘typical’ older female cyclist, or would you prefer bike user? Leaving aside the linguistics for the moment, the situation you describe could be dealt with by political willpower which imposed compulsory Bikeability training in all schools; financed free Bikeability training through all councils and ran a campaign to persuade the population at large that cycle training is not just for cissies but important in a crowded transport landscape; made a few hours of cycle training a part of driver training (just as some haulage contractors and I believe the London transport authority now require lorry drivers to ride a bike during training); invested more money in traffic police who were empowered to fine drivers on the spot for misdeamenours and trained them to protect the rights of the most vulnerable road users; and finally committed money to the building of infrastructure for those who want leisure routes or need supposedly ‘safer’ places in which to cycle (in my local CTC group there are plenty of women who snort derisively at ‘safe’ routes). From looking around the city where I live, it seems to me that similarly, the more people cycle, the more others are encouraged to cycle and to become confident – Critical Mass stuff. Of course the conditions on UK roads put people off but we are all different and confidence can be taught and learnt. Bikeability is a tremendous force for good and I am disappointed that you have paid little attention to it. Finally, for the record, I have 5 bikes of different types and I have three daughters who own at least 2 bikes apiece and who are all keen to be on a bike for both utilitarian and leisure purposes. I really don’t think we are that odd. Did you not find any keen women cyclists/bike riders to interview during your study? And just to bang on a little further about cycle training, ie. Bikeability, it’s really worth it and not just for kids. 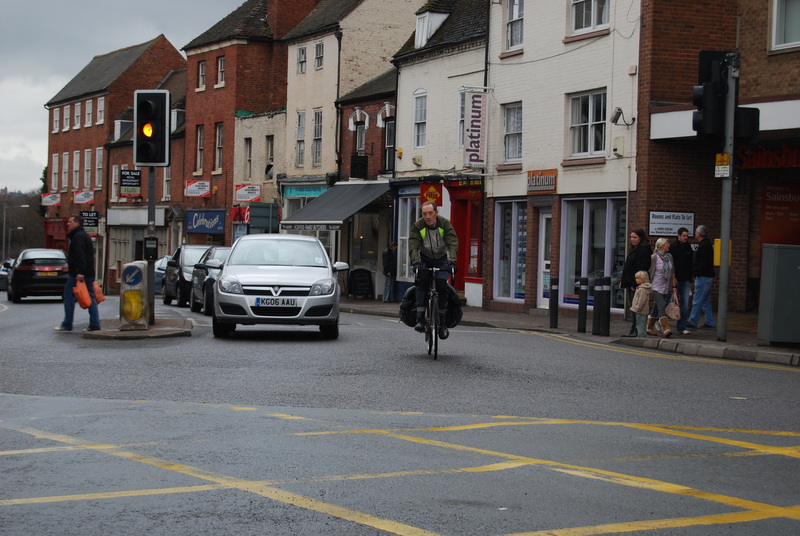 It gives confidence through teaching awareness of how to cycle on modern roads – that means understanding use of speed, road positioning, communicating with drivers by your own behavior and by looking at them (when you look at someone, eg. waiting in a side road, they know, they will look back at you!). You will also be given an opportunity to improve your control of the bicycle, to learn how to keep your balance, look over your shoulder and give clear signals and move about the road when safe. It really isn’t difficult and it’s a darn sight better than shrugging and cycling on the pavement (though of course kids are better off away from the roads till they are older). I wonder how many ‘cyclists’ are aware of cycle training. How many of them have even heard of Bikeability? There are lots of training organisations out there and they do a damn good job. Find them through the Bikeability website or find individual cycle trainers through the CTC website. Anne, I think you’ve missed the point. I think Dave deliberately discusses three male (and white) cyclists precisely because they fit the common profile of most regular cyclists today. He does express some discomfort in suppressing the example of the older lady Jo. There’s no doubt that there are confident, assertive female cyclists out there, but I don’t think that alters the points he is making. Additionally, I think the training issue is a red herring when it comes to ‘normalising’ cycling. Bikeability may well be excellent training, but no amount of training will ever persuade the masses to cycle in traffic. Surely that’s obvious? I only feel familiar with a small part of the UK so I can’t comment on whether most cyclists are ‘white’ but it’s probably true. However, I do not agree that confident males make up the majority of cyclists today even though men might like to think it is so. Men often simply fail to see or acknowledge women. One of my daughters recently did an internship in a community bike workshop. She talked about how so many men couldn’t handle the fact that there were women working there who actually knew how to mend a bike – ‘they’d take the tools from my hands and then not know what to do with them!’ She said. In club cycling, there are lots of men. however, around town, I see women cycling all the time, it’s mostly women who cycle their kids to school. It’s probably true that women in general tend to be more careful than men and would have no problem avoiding A roads or getting off if conditions warrant. I would call that common sense not a characteristic specifically of women. Indeed, it is something that cycle training would teach – taking care of yourself! Does that make them into non-cyclists. I wouldn’t say so. We live in a busy, car dominated culture. We will never return to a 1930s England full of quiet roads, neither will we ever have the money or space to develop a separate, fully functioning and maintained separate cycle infrastructure. The change to a more cycling friendly culture will only come by changing mind sets. I see that already happening through Bikeability, Sustrans Bike It officers working in schools and similar schemes. Children are getting back on bikes these days. I was once a not very confident cyclist but thanks to the Cycle Workshop in Bristol trainers, I will now happily cycle round busy roundabouts. I am not unique, I just decided that I wanted to be a better cyclist. What does piss me off though is the number of men who practically give themselves heart attacks reovertaking if you happen to pass them on the road, the one’s who assume you don’t understand gears or don’t know what you want when you go into a bike shop. I find the description of ‘Jo’ a little patronising. People have different reasons for cycling at different times in their lives and I’m afraid the presence of all those Lycra-ed confident males may actually be off putting for many women! I think it is hard to become the bold risk taking person that can make their own space on a busy rush-hour multilane road. I also don’t like seeing the term cyclist defined, broken down and attached to individuals that can deal with the stress of a fight with the traffic. As a regular rush-hour commuter I know very well that it is a stressful fight and on a good day I have someone cut me up, on a bad day a white van mirror knocks me off my bike. I disagree with this summary. My cycling experience has been expensive, often inconvenient, not always straightforward and has even caused me some health issues – there is no doubt I am causing wear and tear on my body (but no doubt there are health benefits). However every day at 6:30am I face my cycle to work and most often I enjoy it. A reliable bicycle can be cheap compared to a car but after 3 years of 3000miles a year commuting I have discovered that I need the good bike kit, lights, regular expensive services and parts but that might be due to 6 miles of my 10mile route being on a muddy trailway. It has not been the lean, clean super cheap alternative to the car that I was hoping for. I don’t think a commute is easy, cycling is hard work and a challenge in urban environments and I am not sure that trying to define the difference between a real cyclist that owns the road and those that step off at a tough junction is going to help improve the roads for cyclists. I’ve started using cycling as part of my commute several days a week. I have never cycled so much before – about 4 return journeys a week for the last 6 months – and I use country roads. What I’ve realised is how annoying it is to slow down and stop when you are in “full flow”. (Not so bad when you’re puffing up to the traffic lights at the top of an incline!) I’m a 49-year-old woman but the 12-year-old tomboy in me wants to stand up on the pedals and zoom along. It’s fun. And I think commenters above are right that the speed, the zooshing along, the pedalling rhythm and the sheer freedom can actually make you a dangerous commuter. You can get into a sort of zone – it’s interesting that one of your case studies had an accident because his head was down at 30mph. But the essentially anarchic nature of cycling, and the low technology of the bicycle, means we couldn’t regulate cyclists’ speed if we wanted to. Yet, 30mph and not paying enough attention is a potential recipe for disaster, even if of a lower order than the potential disaster of an inattentive motorist. I know there is a strong argument that cyclists need speed to stay out of trouble and to keep their space in fast urban traffic, but I worry that speed then becomes an imperative, a right and a habit, when actually the point is to get from A to B safely. I laughed at the comment above on the Sustrans guy alienating his audience by wearing cycling shorts… perhaps indeed there are cyclists, and there are bicycle-riders, and ne’er the twain shall meet? 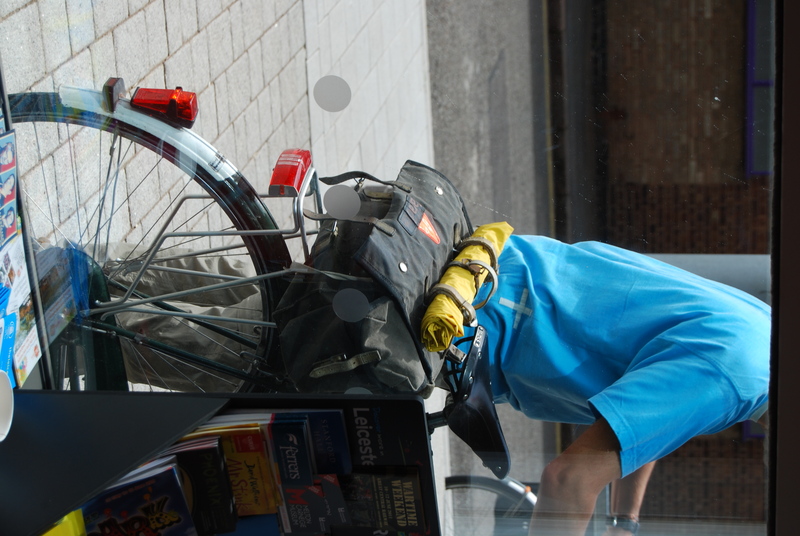 I also laughed at the anecdote of the sustrans bloke in the shorts. Perhaps a good rule-of-thumb as to whether someone is a “cyclist” or a “person who rides a bike” is the ownership of a pair of cycling shorts. They are, of course, blissfully comfortable. Which last remark, despite the fact that I tend to walk most journeys under two miles, does make me a “cyclist”. Thanks everyone for such thoughtful responses, comments, descriptions and criticisms. I’d like to respond to everyone individually, but right now I don’t have the time. But suffice to say, that although obviously I strongly agree with some and radically disagree with others, they’re all much appreciated. 3) and these identities make it difficult to advocate for ‘the right things’ when it comes to getting Britain on its bike (i.e. mass cycling). On Wednesday I was invited to give evidence to the current Parliamentary Inquiry into ‘Getting Britain Cycling’. It was of course an honour and a privilege, and a pleasure, to do so. But perhaps what struck me most of all was *even here* (a room full of people who are all (I assume) very pro-cycling), how little ambition there seemed to be for ordinary, everyday cycling. It felt like we still don’t, actually, know how to talk about it; as though as cycling advocates we reproduce our own enforced marginality in every utterance we make. We’ve ourselves been oppressed by the structures which have oppressed us (or at least, oppressed our practice, of cycling). At the current historical conjuncture, British cycling advocacy, to be effective, needs to be bold, ambitious, strident and – above all – united. But it is not because we’ve learned too well how to appreciate crumbs from the car table. We still haven’t figured out what we want. And so there’s too little conviction when it comes to first articulating, and then demanding the resources required for, the way forward. I would argue (though I would need to apply more critical thought in order to make a convincing case) that one of the reasons we have such crap, ineffective and little-used ‘cycle facilities’ across the UK is because those campaigning for them (committed cyclists who quite rightly want to retain their right to ride on the road) *don’t actually want them*! So at the very outset we have a tremendous ambivalence about their value and likely use. This is no way to run a rail road! And it’s no way of getting Britain cycling either! This is why a new organisation such as The Cycling Embassy of Great Britain is such a necessary breath of fresh air. If we are serious about advocating for mass cycling in Britain (or indeed elsewhere) we simply must stop perpetuating our own marginality every time we open our mouths, by refusing to articulate and demand what we know is actually required to get people cycling; that has very little to do with what will keep us cycling, if we already cycle. And it involves technocratic and bureaucratic discourse (important though those are) much less than it does political and cultural discourse. 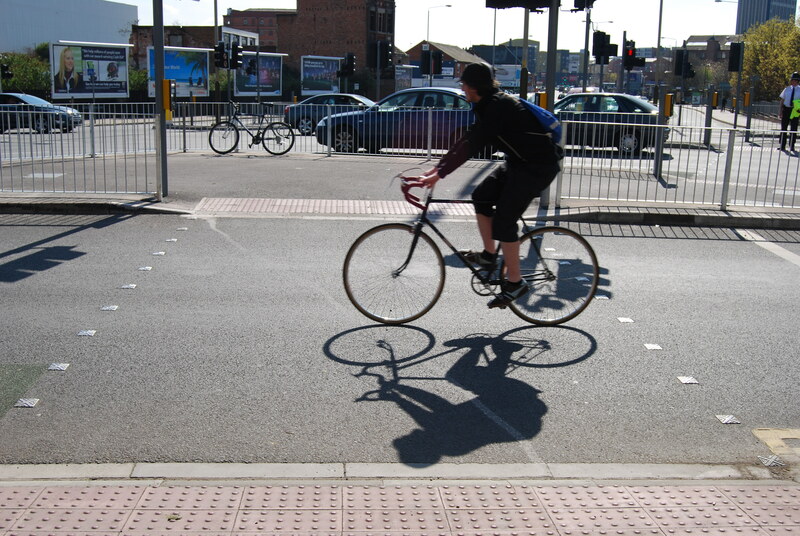 To make cycling mainstream we simply must break out of our own marginality, but we can only do that if we first see it, acknowledge it, and recognise the ways in which just perhaps we inadvertently are contributing to it. That’s all more of a rant than a reasoned analysis, but I want to put it out there, to see if there’s any response?! Thanks again to everyone for taking the time to read, and sometimes to respond. It’s really appreciated. As you’d expect I tend to ignore the facility, thus incurring the wrath of some numpties whio use its existence as an excuse to demand that I ‘get off the road and on the path where you belong’ (with added sweary words).. I know this facility gets a lot of use at weekends by families (who often drive to the start of it), because it goes through some fine scenery. Of course that it could have met both my needs and theirs, but the great and good seem, as I said, very happy with it as it. My feeling is that if this facility is the best we’ll get, there really is no point to bothering, In fact I’d probably campaign against such things, because all they achieve is to make my life harder than it need be. To be complete, I do know (having lived in Switzerland) that it can be done better than this. But I’ve never seen it done better here.